Sometimes, I work from home. The rest of the time, I work in a library or coffee shop. 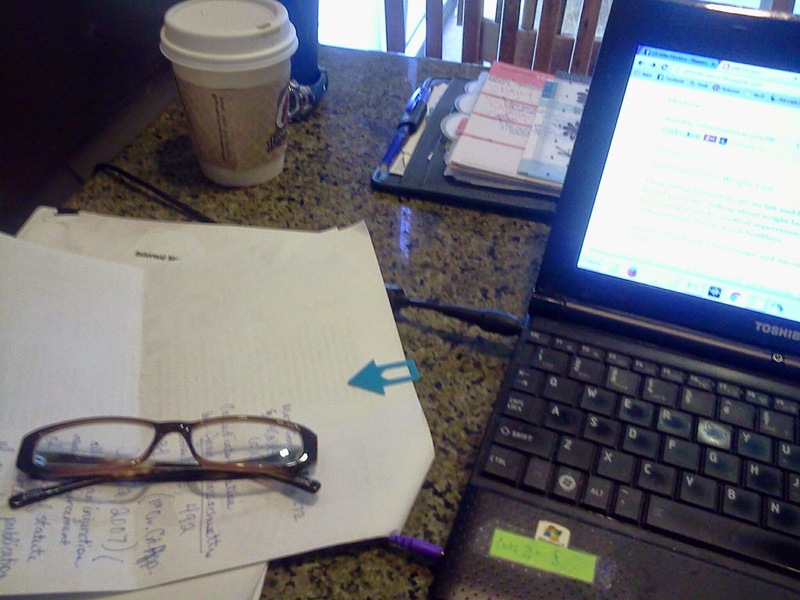 But no matter where I work, I have a flexible but established system for setting up the "desk area" (in the picture below, a table at CCs Coffeehouse). Working remotely does not excuse me from needing an organized work space in order to accomplish as much as possible. I set up my laptop in the middle of the table and whatever I am writing on (a document, in this case, but sometimes my planner) goes to the left (as I am left-handed). TIP: Right-handed folks might want to reverse the set-up. Trash (old notes to be discarded, empty coffee cups, anything to toss) goes behind the laptop to the right. I used to not have a trash area. I kept mixing trash with stuff to hold on to and accidentally throwing away the wrong thing. Items for my purse, such as my glasses, water bottle, watch, or cell phone (if any of that needs to be out while I am working) goes to my left, behind the laptop. My planner goes here if I am not currently making notes in the planner. I used to keep the planner in the writing area, but sometimes I'm working with a document and the planner gets in the way. Overflow documents (maybe source books or a chart) go to the right of the laptop. Writing goes where it is most comfortable to take notes or draft by hand. TIP: Make up your own consistent set-up and jot it in the Notes section of your planner until you learn it. Consistency will keep you organized. The idea of teaching yourself a working set-up might sound silly, but it means you waste tons less time packing away your desk (even if you work at the same desk everyday) and you get to stop shuffling piles around just to get work done. I do the same sort of thing in my kitchen, when prepping dinner. I have a consistent set-up and it makes cooking a neat, no-brainer task. Maybe I'll take pictures and tell you about that sometime soon. In the meantime, click below if you want to join the conversation on Facebook about bringing order to our lives. I look forward to chatting with you. Would love to see your kitchen setup! Oh please. Kitchen setup!! By the way, another brilliant post. I will be making notes tonight. Thank you ever so much! !